3-ways sporting exhaust SD2 for Lotus Evora. Exclusive PB Racing part! 2-ways SD2 sporting exhaust for Lotus Evora. Exclusive PB Racing part! Short SD2 sporting exhaust manifolds for Lotus Evora. SD2 sporting long exhaust manifolds for Lotus Evora. 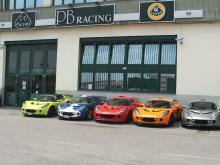 Exclusive PB Racing part! SD2 sporting inox exhaust for Lotus Exige. SD2 manifold and central exhaust for Lotus Elise S3 1.6, great performance and better sound for your supercar! An exclusive PB Racing part! Manifold flex pipe for Lotus Elise/Exige S1 with Rover engine.